Slice the roots off of the garlic bulbs and rub them with 1 tablespoon olive oil. Place them on a baking pan. 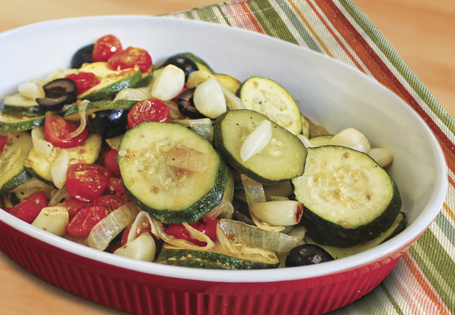 In a medium bowl, combine the cherry tomatoes, zucchini and onions. Toss with remaining 2 tablespoons olive oil, lemon zest and salt. Spread the vegetables on the baking pan with the garlic. Roast for 40 minutes. To serve, squeeze the garlic from the peels and toss with the vegetables and olives. Serve immediately.